“We must obey God rather than men.” With these words, the Apostle Peter declared to the council that they must defy their order to stop preaching Jesus to the people. Regardless of the threats, the apostles knew they had to teach everyone the truth that Jesus is the Christ. Today the church is once again threatened to stop teaching the truth of God’s Word in Jesus’ name. What will we do? Will we cave in as have so many, or will we stand firm and proclaim in truth the life giving message of Jesus Christ. A little more than two years ago, the US Supreme Court declared not to be sin that which God, in his Word says is sin. Jesus says in Luke 17:1-2, “Temptations to sin are sure to come, but woe to the one through whom they come! It would be better for him if a millstone were hung around his neck and he were cast into the sea than that he should cause one of these little ones to sin.” When our actions lead people to sin, we are in trouble. But if we are led by the Holy Spirit, we will not lead people to sin. 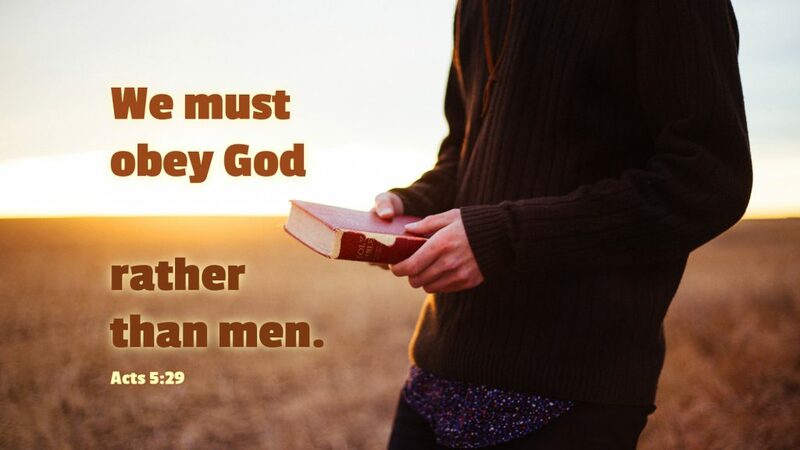 Who will you obey —God or man? Prayer: Dear God, fill me with the Holy Spirit that I might fearlessly proclaim the truth of your Word to the world. Amen.